How Often Should You Experience Cryotherapy? Cryotherapy refers to a procedure, wherein the body or part of the body is exposed to very low temperatures to encourage healing and recovery. The cold therapy reduces the metabolism of cells, this, in turn, reduces inflammation and other symptoms. The patient is exposed to temperatures as low as -110 degrees centigrade for up to 3 minutes at a time. The nearest CryoAction cryotherapy chamber where you can undergo therapy. The number of weekly treatments. If you are a professional sportsman or athlete following a rigorous training program with long hours of daily training it is common practice to do at least one daily session, in some instances even two sessions. Back to back sessions is not advisable. If you use the therapy as a treatment for chronic pain and inflammation between 3 to 5 sessions per week is advisable, once it is under control 1 to 2 times per week is sufficient. Many people prefer to undergo cryotherapy for the health and mental benefits from exposing your body to the cold therapy and 1-2 times a week will be sufficient. Being regular is key to success. Everybody has different needs and reasons why they go for cryotherapy but the key to success is regular treatments to ensure long-term results. Like any training exercise, regular treatments are necessary to help the body rid itself from inflammation. The view is held that when you start treatment, your cryotherapy program should be kicked off with 2 weeks of intensive therapy of 5-7 sessions per week, to assist the body to rid itself of inflammation and thereafter stick to the recommended number of weekly treatments. 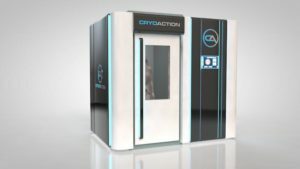 CryoAction offer various options to ensure that athletes, sports clubs and all people in need of whole body cryotherapy can get access to it, throughout the UK. To achieve this they offer bespoke CryoSolo chambers, integrated cryotherapy chambers, transportable cryotherapy chambers and rental cryotherapy chambers.